Ben Simmons (with ball) and teammate James Ennis III (right) will both miss Monday night's game. 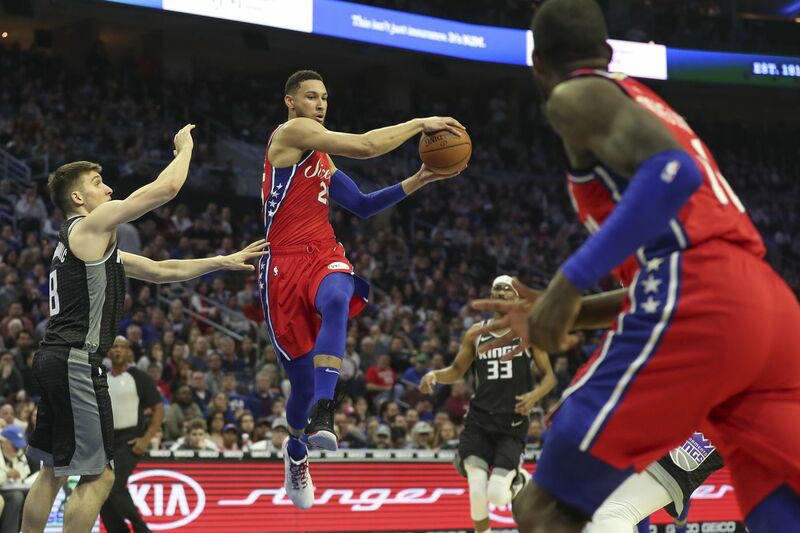 ORLANDO – Ben Simmons and James Ennis III are sidelined for Monday night’s game against the Orlando Magic at the Amway Center. Simmons, the 76ers All-Star point guard, has a stomach virus and will miss his second game of the season. T.J. McConnell will start in his place. Ennis is out with a right-quad contusion. Coach Brett Brown expects the reserve swingman to miss just this game. His absence provides playing time for Jonathon Simmons, who did not play due to the coach’s decision in the past five games. Rookie guard Shake Milton will also see action. The two-way player was with the Sixers’ G-League affiliate and rejoined the team on Sunday after the conclusion of Delaware Blue Coats’ season. This will mark McConnell’s second start of the season. The fourth-year veteran is averaging 6.3 points and 3.6 assists, 1.1 steal and 19.4 minutes in 67 appearances. He’ll start alongside Jimmy Butler, Tobias Harris, Joel Embiid and JJ Redick. Simmons is averaging 17.1 points, 9.0 rebounds and a league fifth-best 7.8 assists per game. Ennis is averaging 5.5 points, 3.3 rebounds and 15.4 minutes in 15 games since being acquired in a trade in February. The Sixers hold a 2-1 season series advantage over the Magic (35-38). Orlando will have a starting lineup of Jonathan Isaac, Aaron Gordon, Nik Vucevic, Evan Fournier and D.J. Augustin. The Sixers’ next game is Thursday night against Brooklyn at the Wells Fargo Center.